Now that the long winter cold is winding down and spring is in the air, get out and enjoy our natural world. 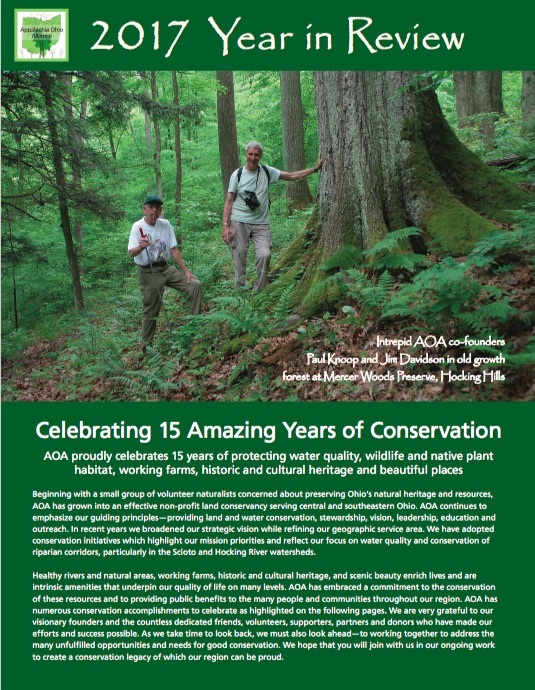 Visit one of AOA’s newest preserves and help us make a lasting difference by planting trees to reforest a portion of the Hocking River corridor in Fairfield County. A variety of new trees will help reclaim and restore a section of old field to bottomland forest, protecting the riparian corridor along the Hocking River and helping to thwart bank erosion. AOA will provide shovels, gloves and trees to plant. Please dress appropriately for the weather and site conditions. The field may be wet or muddy if we get much rain in the preceding days. This is a family-friendly event – feel free to bring the kids and instill stewardship values. AOA acquired the Ellinger property as part of our Hocking River Conservation Corridor Initiative. Afterwards, feel free to stay and explore the property and river. Time: Meet at 10:00 a.m. Location: Meet at Flight of the Hawk Park on Old Logan Road on the west side of Highway 33 north of Sugar Grove. Due to limited parking and site conditions we will have cars available to ferry people back and forth between the Park and the Ellinger Preserve property, which is a short distance away. What to Bring: Feel free to bring a lunch, snacks and/or drinks of your choice and stay to enjoy the Preserve.